Letters and drawings from a doomed generation of university students have gone on show for the first time. The letters were written during World War One to a professor by former pupils serving at the front. They provide poignant insights into the experiences and attitudes of four men whose studies were interrupted by war. One of the correspondents was killed in action, another died in the flu epidemic that swept Europe as the fighting stopped in 1918. The exhibition, Aftermath, begins at the University of Manchester's John Rylands Library this week. At its heart are letters from four former students of Professor Thomas Frederick Tout (1855-1929). Three served at the front; one was a conscientious objector. As well as including vivid descriptions, they contain news about the fate of other students and historical references to the places they have travelled through. 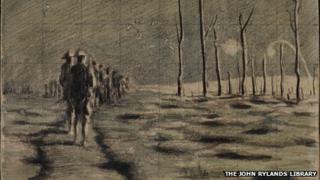 They are displayed alongside six specially commissioned works by University of Salford visual arts students, and three previously unshown sketches by a soldier serving at the front, Walter Phythian. Perhaps the most poignant letter is from Herbert Eckersley, written in October 1917. He writes that "every day seems more interesting and exciting" and hopes his letter will "thrill" his old teacher. He grumbles mildly about being forced to pitch and break camp six times in a single night but goes on to present an optimistic view of progress at the front, albeit with hints at the dangers and discomfort he was facing. "All our moves were forward ones, each one hotter than the last." He describes working on drainage ditches around artillery positions "nearly waist-deep in water and everywhere well over the ankles in mud, and in addition it frequently rained. I leave you to imagine the results." He tells the professor of his lucky escape when he was hit by a shell fragment but suffered only bruising, and he writes enthusiastically of the "magnificent" British artillery barrages. "We certainly seem to have the upper hand," he writes. "All our attacks are normally successful". Eckersley concludes with the hope that he will be back in Manchester the following year to complete his thesis. He was killed a fortnight later near Ypres. He was one of 300 University of Manchester students who died in World War One. The descriptions of the front line are supplemented by the drawings of Walter Phythian, who survived the war after fighting in the Ypres salient. Together they have provided inspiration to the University of Salford art students, whose work also forms part of the exhibition. Artist Jill Randall, a University of Salford senior lecturer, said the archive was "a source of huge inspiration" to her students. The exhibition, which is free, runs until 29 June. Its co-curator, Jacqui Fortnum, said it brought together "examples of protest, reflection, memorial and invention". "It is remarkable how in the face of such appalling experiences during war, so many people have found a way to be compassionate and creative," she said.